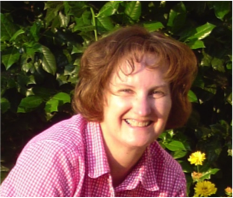 Becky is just about as sweet as they come and I'm happy to share her quilting journey with all of you! I started sewing when I was 12 years old. Our summer babysitter was 16 and had taken sewing in Home Ec in school. My mom had just bought a new sewing machine so we sewed all summer and I was hooked after that. In High School, I took a tailoring class and sewed a lot of my own clothes, but had a fascination with quilts early on. The quilt on the left below is a lap quilt I made in High School and the other I made in college. Both are tied with yarn. I still have both quilts and they’ve been well used. I love that you still have these quilts. So, you've been quilting since high school? I’ve been quilting on and off for a very long time. Some seasons of my life have been more productive, but I’ve always done some kind of craft. Last year, I hand stitched snowflakes for all our Christmas cards. That took a very long time! Oh, I love to make Christmas cards! How did you to get into quilting? I remember seeing some quilt tops at my great grandmother’s house when I was young and now I wish I had some of them. I think they planted a seed for me. What is it that drew you to modern quilting rather than a more “traditional/classic” style? I’ve sewn traditional quilts for a long time and have fabric for several quilts sitting in a cabinet, but they didn’t seem very exciting. Ann Solinski invited me to a sew day at Oklahoma Quiltworks for the Modern Quilt Guild about 2 years ago. I enjoyed meeting new people excited about quilting. Modern quilts are often bright and cheerful and you can use traditional designs, some brighter fabrics, modify the design a bit and it becomes a modern quilt. It has been a way for me to connect with Heather, my daughter-in-law, who loves to sew and quilt, too. We have made 3 modern baby quilts together for friends and a cousin. Now, happily, we can start sewing for our first grandson due in early August. There are so many creative and talent people in the world of quilting. Who do you find inspirational? There are so many lovely patterns and fabrics out there. I enjoy taking classes with quilt teachers. It was fun to take a class from Carolyn Friedlander and hear how she has navigated developing patterns and fabric in the modern quilt world. What styles of fabrics speak to you the most, and why? I have fabric and patterns for the Jaybird Park Bench and Rock Candy designs, but haven’t started them. In the recent past, I was drawn to Bridgette Heitland’s Zen Chic’s Juggling Summer and Comma fabric line. I’ve loved the brightness of Kaffe Fassett fabric and Heather has really drawn my eye to the gray fabrics. I made a queen size chevron quilt as a graduation gift for Heather from the Comma fabric. I saw a picture on Pinterest and made up the pattern so the quilt was on the living room floor for a very long time. Heather was with me before Christmas when I picked it up from being quilted and she kept asking me who the quilt was for. She was very excited when she opened her present and saw the quilt. It brings me great joy when someone really appreciates the time and effort put into making a quilt. I also have part of a quilt made using the Off Track pattern and the Juggling Summer fabric. Even though I love whole fabric lines, I’m hoping to branch out more to mix and match. When are you most productive? When do the most ideas strike you? I love sewing in the late afternoon after work, but usually evenings are my time to dream and sew and Sunday nights while watching OETA. I like the motto that I used with my son, Jim, when he was young taking Suzuki cello lessons, and that was, he had to practice on the days he ate. So I think that should apply to quilting, too! Is there a project you're hoping to tackle in the near future? I just bought some nice linen fabric to make a Super Tote. It looks so handy for traveling. The Metro medallion with the quick curve ruler looks fun. I’m thinking about making Jennifer Sampou’s Elephant and I quilt. Our son and daughter-in-law brought me some fabric from Africa and I think it would be fun to use it in the quilt. It might even be a baby quilt. I have some fabric from Liberty of London that I bought while in London last year and am waiting for an inspiration to use it. When I have more time, I really want to practice and explore machine quilting. I’m pretty good at meandering, but need to get more proficient with other designs. I actually have several quilts that I really like. The first is this queen size quilt I made for our son’s wedding. 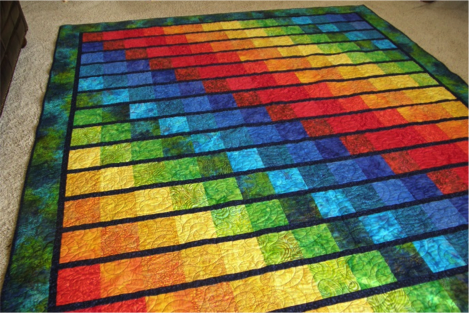 Jim wanted a rainbow quilt and Heather wanted bright colors so I used all batiks. I think it led the way to modern quilts. The quilt pieces resided on our living room floor for about 4 months. It was a labor of love and they both have an appreciation for quilts. 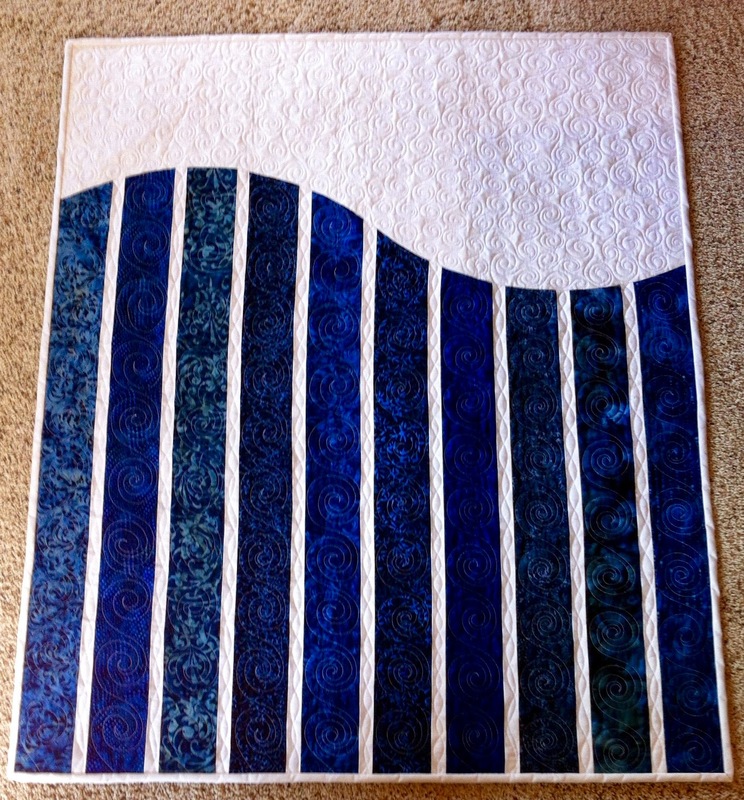 A wall hanging I enjoyed making is the blue and white Making Waves quilt I had hanging in the 2014 OKCMQG quilt show in Edmond. It now looks so great on the wall by my piano. I just finished a quilt with sailboats on it for my sister in Minnesota. It was a free Moda pattern that I modified to make it my own. They live at the lake in the summer and race their sailboat. I’m excited to give her the quilt when I visit next week. I love your Making Waves quilt too! Did you ever have a quilt project go terribly wrong? It was my first attempt at a queen size quilt, a Trip Around the World kit. In 1982, we were living in Fairbanks and I joined the Cabin Fever’s Quilt Guild. It was the first time that I felt a kinship with others who loved quilting and I was also introduced to many new quilting tools that have been invaluable on my journey. I learned to hand quilt with a small group of young women while our babies played. It took me 3 years to hand quilt it. The border and backing fabric were a cotton blend and it wasn’t until I entered the quilt in the Alaska State Fair and got the critique back that I found out I should have used all cotton fabric. I learned a valuable lesson but I did get a 1st place ribbon for the quilt. I also sewed and machine quilted many baby quilts with a herringbone pattern during our 6 years in Alaska. If you had to choose one must have book or blog to visit for modern quilting what would it be? There are so many blogs on the Internet: Moda Fabrics Blog and Moda Bakeshop have interesting patterns and many are free! Ami Simms has some interesting ideas and baby things. I often check out blogs recommended by modern quilters: Sew Mama Sew, and the new Block magazine/book from Missouri Star Quilt Co.
What is your advice to someone who wants to jump into the world of modern quilting? Explore the Internet, take classes, join a quilt guild and go to sew days with the MQG or at a quilt store. I was recently sewing with Haley, a 12 year old girl and showing her my selection of quilt books. She responded with, why would you want to buy books when you can go on the Internet and find tutorials and free patterns. I like sewing with others. It gives me energy and I often learn something new. Sometimes, I lose interest in a project and set it aside for a while, or in the case of a kaleidoscope quilt I made at Quiltworks about 15 years ago for a very long while. It’s in softer pastels so doesn’t really speak to me and I haven’t had a plan for it so it has been hard to finish. When I have a person in mind for the quilt, it usually goes together more quickly because I’m very excited to share my labor of love with them. I only give quilts to people who will treasure them. I want them to feel like they are wrapped in love when they use the quilt. Thanks Becky! I love to hear what inspires people and you've just inspired me to go finish the baby quilt I'm working on!